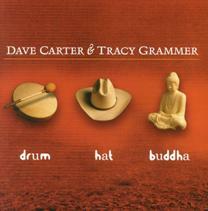 George Graham Reviews Dave Carter & Tracy Grammer's "Drum Hat Buddah"
Sometimes I wonder rhetorically, whether there is enough room for all the folk-influenced singer-songwriters on the scene these days. Although the new folk and acoustic scene is a lively one, a look at the pop charts will find nary an articulate folkie. Yet even someone like myself, whose job is it to try to keep up with the work of such artists finds himself sometimes a bit overwhelmed by the number of folkies appearing with new releases, most on independent labels, ignored or even shunned by the commercial media. Even more remarkable is that despite the plethora of emerging singer-songwriters, that might make their albums seem a dime-a-dozen, the proportion of such releases that qualify as being musically outstanding is surprisingly high, with performers somehow managing to take the outwardly simple, and well-travelled form and create worthy art. This week we have yet another new folk record that qualifies without reservation as being top-notch, rising above even the today's high standards for the form. It's by the Oregon-based duo of Dave Carter and Tracy Grammer called Drum Hat Buddah. Their CD combines fine vocals, tasteful acoustic backing and lyrics that are among the best in the literate genre. Like most of the notable artists in the field, the duo has a fascinating background. Dave Carter, who writes all the songs, grew up in rural Oklahoma and Texas, the son of a mathematician-engineer father, described as "music fearing," and a mother deep into charismatic Christian evangelizing. Carter says that those two diametric opposites influenced his restless career, with academic pursuits interrupted by periods of hitchhiking around the country with his guitar, playing in guitar psychedelic bands, and classical piano in bars. He worked as a mathematician and computer programmer, and also attended the Institute of Transpersonal Psychology, practicing meditation and the like. After trying to figure out what to do with his life, he says that his late grandmother came to him in a dream and said to go to Nashville, which he did, driving in an old car from Portland, Oregon, and he eventually began attracting an audience at some of the city's open-mike venues, and becoming friends with Nashville songwriter Buddy Mondlock, who helped to open some music business doors. Tracy Grammer was born in Florida and grew up in Southern California, the product of a musical family, with both her parents adept at playing country music, which she did frequently at home, singing harmony with her father on old country songs. At age 11, she took up the classical violin and soon was involved heavily with regional school orchestras. However, at college, at UC Berkeley, she pursued English Literature and Anthropology as her majors, pretty much putting her music aside for eight years. But at a break in college, she was encouraged to take up music again by a former member of the Sixties folk group the New Christy Minstrels, which she did with enthusiasm. Carter and Grammer met in 1996 when Ms. Grammer saw Carter performing and was taken by his music and quality of lyric writing. She introduced herself and they soon began their collaboration, with Carter attracted to Ms. Grammer's supple vocal harmonies. The duo recorded their first CD in 1998 in Ms. Grammer's kitchen, but last year released their first nationally available CD, Tanglewood Tree, which soon won a lot of critics' accolades. The duo have been touring relentlessly since then. Now they are out with Drum Hat Buddah, whose title may have been inspired by Carter's shamanic studies. It's an album of wonderful vocal harmonies, an often classic folk sound, and really fascinating and exceptionally literate lyrics, that often travel places few folksingers have ventured, such as considerations of Merlin the magician as a widower and evolutionary biology, along with distinctive treatments of more familiar subjects. The lyrics are suitably poetically cryptic, but very much reward the effort of pondering them. The musical setting is largely acoustic, but there is a band present for most of the tracks, including drummer Lorne Entress and bassist Donny Wright. Billy Oskay, who co-produced the album with Carter and Grammer is also heard on additional violin beyond Ms. Grammer's. In a crowded singer-songwriter and new folk scene, Dave Carter and Tracy Grammer have created an album that stands out for its combination of exceptional, literate songwriting, very tasteful musical backing, and great vocal harmonies in the classic folk tradition. Drum Hat Buddah is the kind of record that can stand up to many listenings, revealing something new each time, especially with Carter's lyrics' exceptional depth. The album does have two technical drawbacks. First, it's a bit stingy, coming in at just under 41 minutes in an age or hour-long CDs, and second in sound quality. We'll give this CD about a B or B-minus. The mostly acoustic instruments and vocals are generally well-recorded individually, but the overall recording has something of an in-your-face, compressed sound that is inappropriate for this kind of subtle music. Electronically pushing the CD to sound loud most the time is undermines some of the nuances and dynamics of the performance by the fine musicians. Folk duos have had a long history in the music, though co-ed twosomes like Dave Carter and Tracy Grammer are rarer. Their new third CD shows that Carter and Grammer comprise one of the bright lights in a now heavily-populated field.